I crossed over from West to East Berlin at a checkpoint near the Brandenburg Tor. There was an eerie quality about it, as if the land were in mourning. Or in fear. Begin with the incredible autobiography of Brother Andrew (God's Smuggler). From 1955 to the present hour, this remarkable man has risked his life smuggling Bibles into countries where Scriptures are outlawed. His report, packed with dangerous adventures and high drama, testifies to God's miraculous provisions for those who follow where He leads. Journey into places still hostile to Christians - with profiles on courageous champions of the faith. Meet teens and others across the globe who are mercilessly persecuted for their faith, yet display extraordinary joy. 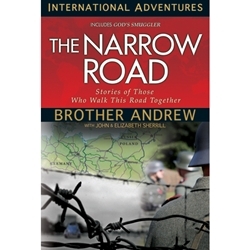 Their stories, along with Brother Andrew's, will forever change the way you walk the narrow road. Brother Andrew is the founder of Open Doors. Open Doors serves persecuted Christian worldwide through community development, Bible and literature distribution, leadership training and education, and ministries of prayer and advocacy.